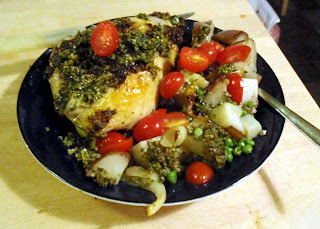 Pesto chicken is one of my favorite autumn and winter recipes. First of all, because it involves pesto slathered all over the main course and pesto is next to godliness is my world. Also, it is a lovely little one pot meal that requires little work to produce something completely warming and satisfying. The genesis of the recipe really goes to our former landlady--Althea--who actually, over time, became the bane of our existence as renters, but this is the one good thing that came out of knowing the woman. Instructions: Pre-heat the oven to 400 degrees F. Rinse your chicken off and pat dry. Put the chicken in a covered baking pan. Toss in the diced potatoes and onions, both around and under the chicken. 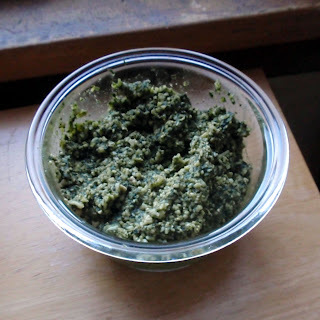 Set aside a cup of the pesto in a separate dish for later (do not use this for putting on the raw chicken). Smear the chicken and potatoes all over with about ½ cup of the pesto, then drizzle a little olive oil over the chicken and potatoes. 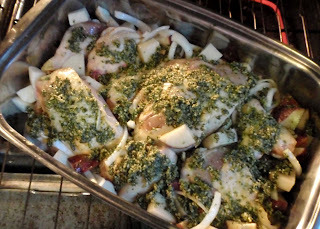 Bake the chicken for about 30 minutes, covered, then take the chicken out and re-smear with another ½ cup of the pesto. Return to the oven, recover and bake for another 30 minutes, covered. Now, uncover the pan and bake for another 20 minutes uncovered. 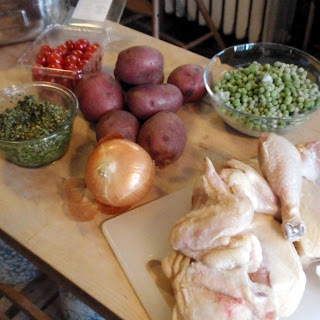 After 20 minutes, remove the chicken from the oven again, and toss the frozen peas into the pan (you may or may not want to use your whole package, depending upon the amount--no need to thaw the peas.). Bake covered for another 10 minutes, then check the chicken and potatos for doneness. Bake covered longer if necessary. Once done, take the chicken out and serve. Pass the remaining ½ cup of pesto and a dish of the chopped tomatoes to guests to spoon atop their chicken and veggies. Super tasy with a nice red wine. Of course, everything is tastier with a nice red wine, in my world. Bon appetit!